Hi everyone! 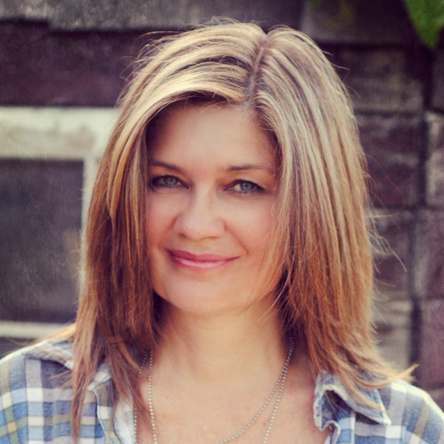 I’m Donna, author of the blog Funky Junk Interiors, where I decorate with salvaged finds. I’m a parent of a teen son, and 2 tuxedo cats, residing in beautiful British Columbia, Canada. My past career was a 22 year sign veteran and graphic designer by trade. When I started creating vintage looking signs for my home, readers asked if I could guide them to replicating the designs. This proved tricky. Not many had the high end sign equipment nor years of design experience for a full understanding on what makes it all work flawlessly. Hence, the idea of the stencils became the perfect answer! They offered all the features readers desired, giving everyone the ability to create professional designs in minutes! The stencils are custom designed by myself, and fabricated / shipped from Ontario, Canada. All the prices are showcased in Canadian funds. 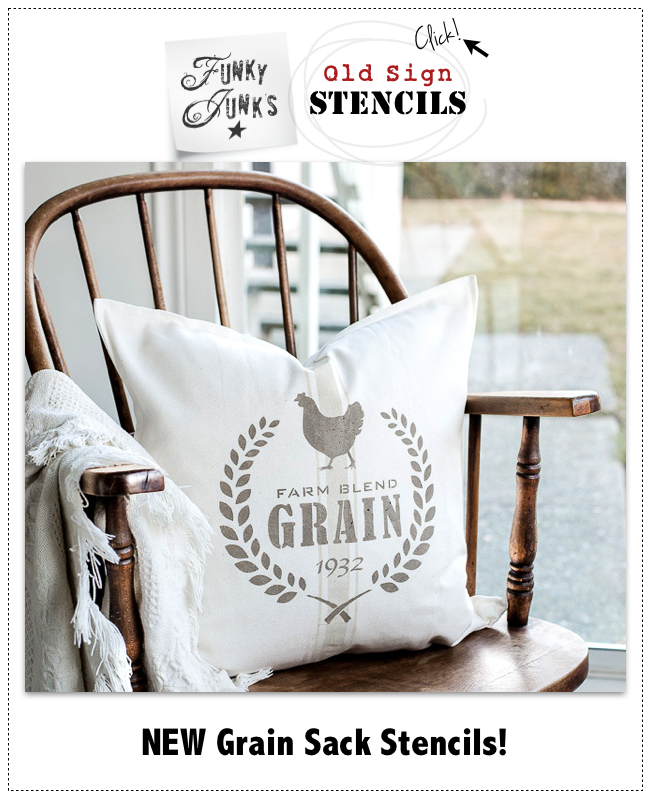 Some of these stencils are inspired by authentic antique signs and crate markings. They are bold on impact (like a real sign), and tweaked to perfection. I honestly have never held a better quality material in my hands. They are made from heavyweight 10 mil mylar, making them incredibly durable and easy to work with. They are also loaded with unique centre and alignment registration marks, making positioning effortless! Many of the stencils were specifically created to mix & match with each other, so you can achieve many more designs with your investment. Being in the home decor industry, we like to offer designs that are currently on trend. We are also careful to create them in such a way that makes them timeless, for many future years of enjoyment. It’s all about the font choices. 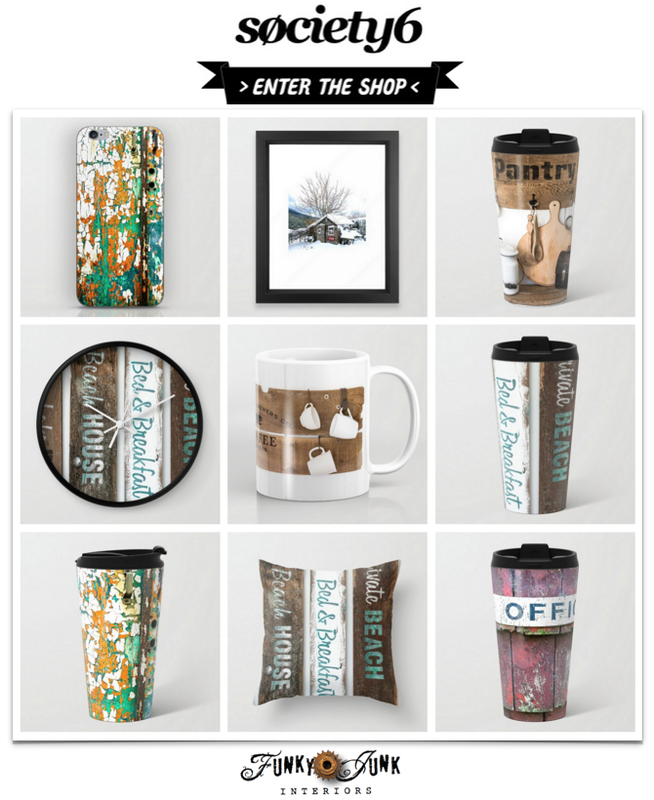 Click above or below to Shop The Store! Wendy, IAMAPINNER2….that is how I came across your website. Love your style and your words are powerful. Most of all I like you are true to you! Look forward to seeing and shopping on your site. We have 6 inches of snow in Minnesota….how’s that for Spring. Love this website! I have been crafting like crazy over the last few years. I just this week found Annie Sloan paint. I believe after finishing my first product with in hours of my first can she will be one of my new addictions. I have enjoyed seeing all of the wonderful things you have created and it had lead me straight to my garage with a plan to my grandparents farm! Spring in Oregon has giving me the creating bug. Thank you for sharing all of your fabulous inspirations. In LOve with everything I see here!!! Moss!!! Love LOVE the moss items. Do you sell or tell how to make these things? Where are you located? Great photography by the way. Anything you see on my blog all has links to the original sources. If you read a blog post carefully, you will see live links that lead back to their tutorials. All the moss creations you are talking about do the same thing. Click on the links and you will be creating in no time! Love your stuff! Do you have a physical location and where are you located? Thank you for sharing all your lovely found stuff redoes! What kind of sign maker equipment do u have? Love love love the look of your website – so warm yet edgy ! You mention that you have a stenciling kit. Where is it; how much is it; can I buy it (can you tell I’m eager to create some signs too)? Awaiting your answer in Ottawa with old barn boards just a stones-throw away. P.S,: I love the design of your site. Did you design it yourself? Wanda, so sorry for my procrastination. The ebook on Making Old Signs is not yet complete. Re: the blog design, I took pictures of it, then had artist Bethany via B Spoke put it all together and guru Josh Leuze code it. It takes a village… haha! Donna, I like your stuff and your web site. I was wondering who did you site and who does your hosting? I am considering doing something similar to your site. I pretty cool and down to earth. Hey Collier! My site was totally custom built from scratch. I dreamed up what I wanted my site to look like, then took photos of the elements you see and sent it to my designer B Spoke. She further enhanced and designed the elements and she had her guru Josh Leuze upload it into a workable WordPress blog. I’m currently hosted by WE Engine. are you currently selling the burlap coffee bean sack window shades? Hi Angela! Sorry, I don’t sell them, just decorate with them at this time. But thanks for asking! Oh My I LOVE everything you do. So happy I found your site. Looking forward to logging in everyday. Thank you for a breath of fresh air. do u have instruction on how to make wine bottle fountain?? Sorry Sheri, I don’t! I just took a picture of one when I was travelling down South last summer. I am wanting to purchase some galvanized drawers. Do you know where I might find them? i found your site off another one but would like to see what you come up with… thanks for sharing ideas. Where did you find your cornucopia wicker basket! Love Love Love that idea! Have a pretty large space to cover. you have some great ideas! I can’t wait for your store to open! Love your website!!!!! Want to follow your blog….please make it happen…. I admire your creativity and get sooooo much inspiration from the projects you share! Great site! Love your ideas with the wood pallets and windows! I too have just discovered Annie Sloan paint over the past few months and have been a painting crazy woman! I have had so much fun….along with your site the ideas are endless! Thank you!! I’m so jealous of the Canadian and American Junkers! You have so much interesting junk over there. I love your website and it sparks my creativeness every time I see it, thankyou. Here, “down under”, I can’t seem to get my hands on much great junk, oh, well, I’ll keep looking. Keep up the good work, Donna! I LOVE your blog and so many of your projects! I too live in a wee town in British Columbia and am always excited to hear of places you have “junked” that I could actually go to! So much of the time other bloggers are so far removed from our locale that in my lifetime I would never get to visit all their fantastic “sources” You had a post on quite awhile ago with a tall metal rack with metal bins in it that was fantastic and I have long looked for one like it (to no avail) It was sold when you saw it but where was that fantastic “store” located? Keep up the great work and plethora of wonderful junking ideas!! Just found your wonderful site and you have made some very amazing things. I was wondering if you made the twig garland on the tree’s in the black box? Such a great idea. I would forgo a real tree to get this look anytime. Lovin the junk! I am a junker too in Alabama!! Do more holiday stuff for us! Absolutely love everything you do! Look forward to seeing more! I love your stuff. I must confess I have the junk bug too and I’ve always loved to think outside the box for the purpose of getting long life out of materials. I love old things in fact I bought an old 1910 Victorian house that my husband lovingly call our money pit. keep on doing what you do and i’ll keep up here in Corning CA. please keep me in the loop..would love to know when ur book is available cuz not only am I a junk junkie but I love books too! Love your work. It is so unique. Waste not want not. Looking forward to more pictures. Keep creating. 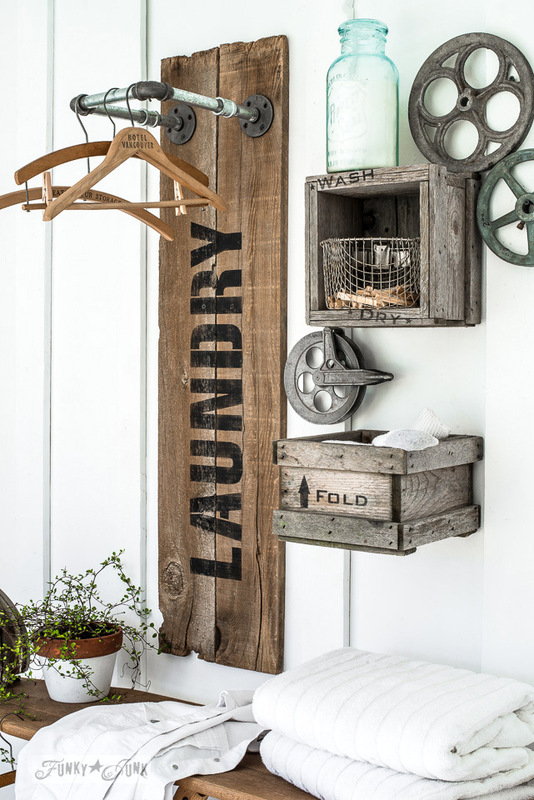 Thank you, can’t wait………………..
Love your ideas to repurpose Junk! Do you give instructions on how to make pallet furniture such as couch? Love your site. Where do you get gunny sackslap? Hey Girlfriend, I thought i was the only one who loved junk and junking….thought there was something wrong with me and now I know I’m not alone. You are such an inspiration. You have given me some ideas as to what to do with stuff I’ve collected over the years. Keep it up my friend. By the way, I live below you in the great state of Virginia, USA. Hi would you have those stencils for the crate stairway you did available to sell. Thanks. I discovered your blog through Pinterest. I realized that the pins I liked kept saving were all from you! I love re-making my garage sale finds, family hourded antiques and finding new ways to display them. My Country Junk style is nothing like any of my friends, so they all think I am nuts! Thank you for the inspiration! I love Funky Junk! I would buy! Looking for your ebook on making your own stencils?? LOVE your stairs, signs….well everything!! Great work!! Let me know when your ebook will be available….please?!! Thanks Donna for your great site. This is right up my alley. We are always looking for junk to repurpose. I love the look. Can’t wait to explore some more. I just love all the things you have made and hoping your items will be up for sale !!! I love the desk made with the saw horses, wood pallet,ladder. where or how did you create the large white shelving/back drop !! I want to re-create the desk, love it !! i can’t tell the white piece that will hold files/more it came from a storage facility ?? Hello Donna, what a wonderful website-to-be! I found you on Pinterest and follow you on Facebook. I love your ideas and all the wonders you create! Wish your store was going to be here………can’t wait for a website to shop. I LOVE the crate stairs. I thought I read you would have the stencils available. Where would I find them? I would love to do this on our unfinished stairs. I love love love your staircase. PLEASE if you sell these stencils I want to be the first customer. So darling. I need to do this on my wooden stairs going to the basement. I love your stuff! I can’t wait to try to make some of your ideas! Let me know when you open your store! WOW WOW WOW! I went online looking at rock gardens and somehow landed on your page. To say I’m impressed is an understatement. I want to completely revamp my place and go yard sale grunging. Thank you for being so creative and inspirational. You are truly gifted! I just came across your site by accident. I was googling how to make a fountain. I LOVE your site. Everything you have shown is my style of decor. I just don’t have the imagination you have. But I do have a lot of junk so I guess I am half way there!! Love the plate valance but I can’t seem to find the “how to” on the blog… help please? BTW all of your things are just amazing! I love your blog. My husband and I recently moved into a new build house and I can’t wait to decorate and make it look less new and more old. Have you ever thought of having someone email a picture to you of a space and then suggesting your ideas for a fee? So creative, love your stuff. Can’t wait for your store to open, hope you plan on shipping! You have an unbelievable gift in creating and decorating. You should have a shop and sell your items. Your website is awesome! When making your wood signs, you mentioned you use a pro letter machine ? What is that, where can I get one ? Hi Susan! I think you’re referring to a project I featured in this post… scroll down for the right link within the post for the how to. Just found your site, looking forward to posts and newsletters. Talk to me about the sofa I see in some pics. The one with the wood arm trim. Old? It is lovely. I would love to find one. Hi Carol! That fella was found at Costo many years ago. It’s nearly 15 years old. I get so excited every time Funky Junk comes up! You are absolutely the best! Hi Donna, Thank you so much for responding. If it wouldn’t be to much trouble, would you please price it out for me and let me know. That way I would know how much. I seriously would like to buy this if it’s not outragious. LOL Thank you so much. Margie, I’m so sorry for all the heartache that’s transpired… truly scary! Blogging will give you something you never even knew you wanted… I vote to just go for it. You have all the makings of the coolest content! I hope you do it! Love your junk!!!!!!!! Keep it coming…….. At 67 I appreciate old things so much!!! Love you, love your site, love your posts! Please get the “shop” section up soon! And be sure to make tshirts!! Would be the best thing since Mason jars to have a Funky Junk shirt! How can I purchase the things that you make? You a very tallented! Love your stuff. When you have a bench for sale please contact me. I’m in calgary so I guess shipping might be steep. Love everything I see! Wish I was creative and talented. I was wondering if you made the wood signs pictured on your website (“Peace Love Happiness” & “Live Large”), or if you purchased them somewhere? I love them! Hi Sarah, they are not mine. I may have featured them at some point. 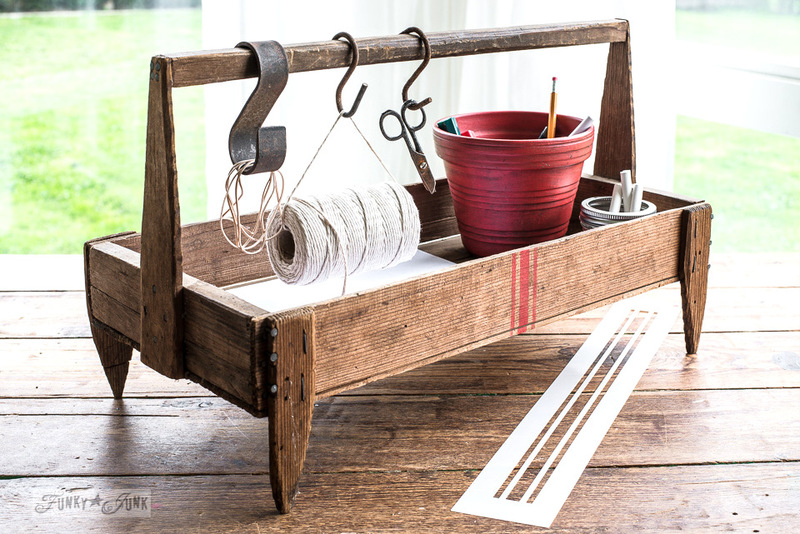 1st time on your website love what you did with the vintage cart! Please let me know how I can order the BINGO sign stencil! So very cool! Do you make items for sale? I was looking at the window with the grapevine wreath and small flowers on it. I’ve been looking around the city nearest me, to see if I can buy brushes that are best suited for stencils. I have one or two Fusion brushes, and one from Homestead House, but I had to travel an hour or more to the retailers that carry them! There’s a large city near me with Michael’s but I haven’t found any there. Is there an other retailer where you buy your stencil brushes? Hello Donna, I love your style!! I can’t wait to buy all of your stencils (they’re perfection X 10) a few at a time. We’ll be moving next year and I want to do the whole place with them, every room! I do have a question though, which stencil brushes are your favorites? Thanks in advance ? I would like to know if you have any new stencils coming out? Hi Elaine, more will be coming very soon! I hope to launch something in February! Do you have any new stencils coming out? I need a stencil to decorate my laundry.. Do you have one? Hi Connie, not as yet, but it’s on my list! 2016 may be the year… 🙂 Thank you for your idea! Donna, this blows me away. I two am starting over, I have a small older place, and your beautiful items would sure look good in here. I so loved the Garden and Pantry items. How do you clean your stencils? Do some paints clean off better than others? I am interested in carrying your stencils in my store in New Mexico. I currently carry fusion paint. I can’t get the link to work for wholesale info. Hi Cindy! Thank you for your interest! Can you please let me know which link isn’t working for you? I love that BED AND BREAKFAST SIGN. I’m a bit confused, as it says…B C and also Ontario…. ( we retired in the Maritimes, from Saul Ste Marie….ont. Anyway, maybe Wendy will order the Stencil? I will email her, and ask her. I love your site, you are a very creative girl, and so is Wendy. Hi Carol! I sell the stencils, not any finished signs myself, but many others do create to sell. I reside in BC and am the designer / idea maker, and I have Joanne that fabricates and runs the stencil store from Ontario. If you’re re referring to Wendy via Front Porch Mercantile, she is definitely the one to reach for stencils or finished projects! Well if I hit a jackpot could buy every stencil from you. Will need to buy one every other month if possible. SS doesn’t leave me with run-over money too often so will have to save up. So love your stencils signs are one of favorite projects to make, always have been. Do have lots of pallet wood for them. Boards have gotten nicely seasoned out in our back yard. Just have to talk sweet to get hubs to pull those pallets apart for me. 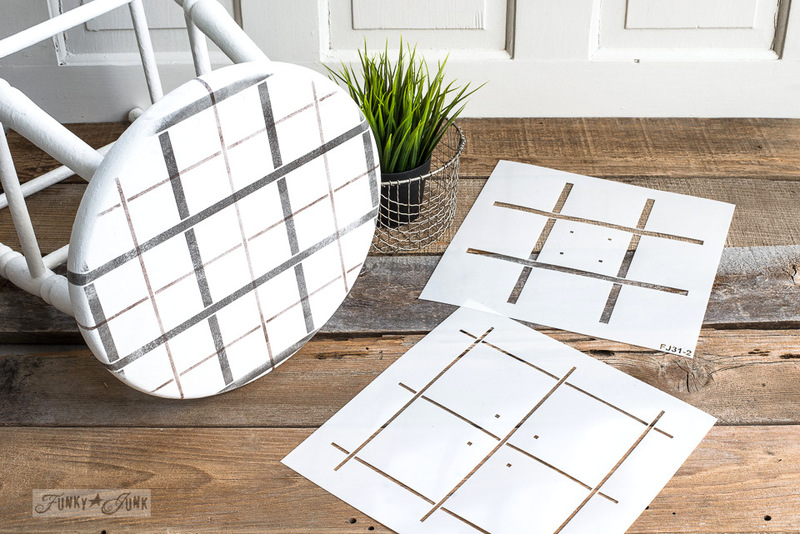 I too am crazy for plaid and am so glad you have made these stencils for the rest of us to use and have a speedy result! Thanks Susan, glad you enjoy them! The buff check took months to refine, so I’m just stoked it works as well as I hoped it would! I just love your site, so inspiring and puts a smile in my heart to see all your creativity. I am looking to make some of my Christmas gifts this year and I love your stencils. I am wondering do you have a stencil of a grape cluster or wine glass? I am thinking of making coasters with wine theme on one side for evenings and coffee beans for mornings. For now I will buy your coffee stencil that has the beans. Hi Gina! Thank-you for your order! At the moment I don’t have any alcohol related stencil designs, however I will add that request to my list. Thanks for the idea! You are not the first to request a wine design. Hi Nancy, sorry, I don’t sell it. If you found it on my blog in a post, it should be linked via text to the original source. It is lovely! Just totally wish that besides adding to the cart for immediate purchase, wish you had a “wish list” or “save fir later” option!! For things I want to remember to buy later (very important memory helper!!) AND to be able to share with others as gift suggestions for my next birthday!! Thank-you RR, that’s a neat idea! I personally have found that if I enter things in the shopping cart and don’t purchase, those things remain in the cart until I remove them. Perhaps just add them without paying and see if it works for you? Big Cartel is a simple store with few bells and whistles. I’m debating moving the store elsewhere so more options are available. Thank-you for your wonderful idea! Do you have a physical location in Calgary, AB? Hi Bethanny! If you use thicker mason jar rims, it’s easier to make. Slip in a tie of sorts inside the rings, (I used a robe belt!) tie tight, hang then adjust. They don’t stay perfectly round if touched or moved around. In this case you could invent some sort of frame to glue the rings to for added stabilization if desired! I didn’t worry about it myself. hi Ive just been looking at yr website I have to be honest im feeling better just for looking and reading …I just want to say thankyou. After the month that ive had… I am feeling more calm and less anxious already…I know that wasn’t yr intention when you created yr site but its wonderful to feel like ive connected with someone/thing that I am always doing myself one way or the other, toodling in the garden creating peaceful spaces to enjoy and building new ideas from this and that. So after all that I just want to say thankyou again and let you know that I am in afar better place in my head and heart since reading you.